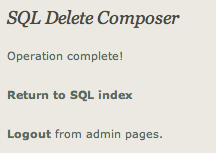 Now that the right composer has been selected for deletion we have to construct a suitable SQL command and submit it. The flow variable composerId was taken from the hidden form field. The next section looks at protecting some of the pages..